You'd think a former Deputy Prime Minister might have a bit of decorum, wouldn't you? Possibly not in John Prescott's case but you can live in hope. Apparently Mr Prescott took exception to this rather innocuous passage in my recent post about my trip to Armenia. One great thing about Armenia is that they cannot abide John Prescott. Apparently he came here as an election observer and achieved the unique distinction of annoying both the government and the opposition. It's the truth. He was there for the Council of Europe overseeing the Armenian elections. For all I know he did a sterling job, but I was left in no doubt about what the Armenians thought about him. I'm told that Mr Prescott is furious with me and that he was behind the release of some prisoners in Armenia and that he is really proud of what he did there. Now if you were a former Deputy Prime Minister and a world statesman, what would you do? Give me a call and explain your role? Drop me an email? Write about it on your blog? No, not in Mr Prescott's case. He has a different way of dealing with the likes of me. He gets his son to photoshop an image of me to post on Twitpic. Oh how we laughed! I won't respond in kind. What I will do is invite Mr Prescott to tell us what he achieved in Armenia and I will happily post it on the blog. Isn't that the adult thing to do? PS Isn't this sort of prank further evidence that most of John Prescott's Tweets and much of his blog is actually written by his son, David? Nothing wrong with that, but why not just admit it. Has fatty got a ten year old son then? I thought his son was an adult who was hoping to inherit Prescotts squiredom? I was in the Marriott Hotel in Yerevan whilst JP was there for the Armenian elections. For the very short time he was in Armenia he seemed to spend his time complaining. Incidentally, he was the leader of the Council of Europe Delegation(MPs), not running the elections or the OSCE/ODIHR observation mission. Most proper observers liken dealing with MPs who come as supposed observers to trying to herd cats. I'm looking forward to election night and being rid of the likes of Prescott, their special advisor's, and relatives. Only problem is I wonder if there is enough champaign in the country to cope with the demand. Perhaps its time to stock up - after all Brown might destroy the pound before his clammy hands and fingers can be prized away from the leavers of power. Oh go on admit it !! It is pretty fu**ing funny !! Nice of Mr Prescott to lend you his T shirt ! Trouble is, is suits him so much better. Stick to your shirt and ties. well it must be tough having JP as your dad........let me guess he was in Armenia on a jolly...and now he is embarrassed. Prescott has a chip on his shoulder, he is sensitive to critisism and his instinct is to lash out in a rage. Prescott has lived with a smouldering sense of jelousy for most of his life, he built his political life around it, why has that person got more than me? Why did that person get a better education than me? An inbuilt bitterness that others had it easier than him, had more money, had better prospects etc. In reality the percieved injustices were his own failings dressed up and transfered onto others, as is so often the case with people with his beliefs. Life in his castle,life with lots of money,life with a title none of it satisifies his deep rooted anger. Prescott is a bitter jealous man with a chip on his shoulder, perhaps he always wanted to be born into the high born gentry and was frustrated that no matter how much cash he piled up and no matter how many 'electrocution' lessons he endured he would always be what he was, a simple rough peasant. I might feel sympathy for his situation then I remember the role of the unions in destroying our shipping industries, wanton vandalism based on political spite denying ordinary workers a chance to work in a once thriving industry brought to its knees and destroyed by Presott and those like him, our once massive docks reduced to barren wastelands. Iain, your invitation to John "Two bellies" Prescott should be sent to your bloggers in Armenia for them to elicite replies from the Armenian blogosphere. Well you look slimmer in the jpeg so perhaps all is not lost on Prescott Jnr? It would be more funny for everyone else if you had a childish spat. Surely Photoshopping photos of John Prescott is what the TP interns are there for? I love the delightful juxtaposing of Iain's measured and sober posting with the contribution sitting at number one in the comments. Obnoxious and insufferable as Prescott its, we shouldn't really take the blighter seriously. Pugilistic loud-mouths like him are probably great recruiting sergeants for the Conservatives. Is he standing at the General Election? Types like him end up in the Lords these days. Thanks to Pukka-Pies Prescott our merchant navy is now the European flag of convenience with British officers and seamen a rarity. Ah, the Son also rises. But David Prescott is an interesting case - with an interesting history. Clearly the Labour Party in Hull are not impressed. I wonder why. By goom, Dale, where's me pies? 'ast thou stolen me pies? Steward! Fetch me a gin and tonic, pronto! Perhaps if you cannot take childish jokes then you shouldn't make them in the first place. Any short search of your archive will reveal countless condescending condescending and patronising remarks and jokes about John Prescott - but the first time he responds in kind you get all huffy and throw your toys out of the pram. This is not one where you can take the moral high ground. You should have ignored it. '... it's called, I think it's called the internet, isn't it, or blogs or something, I've only just got used to letters, John, I haven't got into all this new technology. That from 2006 by Labour's (self-anointed) Mr Internet. But so do Palestinians, Jordanians, Turks, and Azeris. Don't the words adult and Prescott constitute an oxymoron? I'm sure the ignoranus (sic) will get over here as soon as possible, thinking "An Adult Invitation" is something to do with shagging a secretary. Socialists are a bunch of inadequates who believe that the world owes them a living and that somehow others have been more "lucky" than they have. This is why they are so bitter, why smearing comes as a matter of course. It is all about being perceived to be better than your opponents whilst usually lacking any actual ability. This is why socialism fails. The real (physical) world pays no attention to woolly headed lefty theories and carries on diverging from socialist dogma. Eventually, the widening chasm cannot be concealed any longer and at that point the socialist failure is plain for all to see. I used to dislike their approach and ideas, but over the last few years, Labour has taught me to utterly loathe socialism. I have reached the point that I am beginning to think that the McCarthy-ite purges in the USA actually had something positive to them. I would dearly like to expunge this evil political doctrine which has so damaged our country and done so much harm to so many people. Mao, Phol Pot, Stalin, etc, etc - the vanguard of world socialism - killed over 100 million people during the 20th Century and most of them in the first half of the century. 100 million!!! If there was a disease that was killing more than 1 million people per year we would be putting effort into eradicating it forever, yet that is what the heroes of socialism achieved over the 20th Century. 100 million dead in 100 years. Quite an achievement, but for all the wrong reasons. "Prescott has a chip on his shoulder," I recall reading he also has a chipolata elsewhere. No wonder he is so sensitive. "I hurt little sausage" on it! That will put him and his small sausage in his place! Post a picture of a circus big top trying to contain Prescott. Completely missed that paragraph in the original article, and looking back at it, I don't think any of the commenters mentioned it either. Now JP's made sure that everyone's aware of it. Seeing it from his point of view, I can see why he is mad with you. I thoroughly enjoyed reading your first article to say how much they despised him - and the anecdote that he managed to wind up both the Government and the Opposition - BUT what I am enjoying even more, is the news that you have made him furious. Two toilet seats, three Jags, four chins but unfortunately ZERO BRAINS. I expect you had a little chortle when you saw that pic, relax , you were really fixed up. T shirt suited you! What a hoot that was. He is a proud touchy chap sadly! Prescott and his fellow lefties don't do truth. That mock-up was charactereristic of his ilk. Evidently, he found it easier to concoct a lie than to tackle the issues verbally. Or should that be cerebrally? Oh, please, don't let him get a seat in the Lords? How many had this lot of prisoners killed? It's a joke Iain - laugh at it and move on, moaning about it makes you look like a big girls blouse! "I was left in no doubt about what the Armenians thought about him." To be fair, a pretty sweeping statement. Someone could fly into Britain for a couple of days, spend some time with some Labour supporters and leave with the opinion that all was hunky dory. Fair enough if many of the handful of Armenians you met didn't like him - but I think trying to expand that to say the whole country dislikes him is probably a step too far. I doubt many Armenians know or care who he is. ian you are a genius. for years the nasty left bullied,lied and got away with it. this was a good part because the tories dont know how to handle bullies,and the press put in what they wanted,largely supporting labour during their olympic spending spree. you have got it,strike a balance,and never in britain will these people get away with it again,now we have blogs etc. OK Mr Dale, I will reply. In so much as I , John Prescott, big John Prescott, not my son, who is very talented, but not him, just me , can answer the accusations that you make, not that they are true mind, just that they have possibly been made by you, I shall set the record straight. When I was in Albania, or Silesia, or wherever the hell my missus sent me to get me out of her sight, I, and the Labour party, the people's party, your people Mr Dale,well not yours you Tory mouse dropping, but the People's government, your BBC, ...erm, where was I? Anyway I rescued from the clutches of the Taliban, by lobbying hard for whoever they were to be set free by whoever was holding them. I am unconcerned that you might say I was a useless incompetent, I've heard that sort of thing many, many times before and it doesn't hurt me. Sticks and stones may lead a horse to water but a fallow field tells no lie..or something. Actually I once got poked with a stick and it really hurt. Or was it a flagpole? It was Tony Blair when I was snoring too loudly in the next door office. He said he couldn't hear Gordon plotting on the other side of the wall with the noise I was making. Anyway, I did a good job at whatever it was that I was doing in Aruba and you , in so far as I can tell, lets be clear ,not to muddy the issues in the toxic waters , and we can all agree that blowing up london buses is not a very nice thing. If it were yesterday and not today, then we could have a big laugh about it. A t-shirt with Pi or TT would suit Mr Prescott- for someone who has devoured over £ 4ks worth of food on expenses, the mathmatics will be very apt! How are your Photoshop skills? 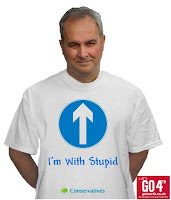 Tracey Temple and Pauline would both look good on Prescott's arm wearing "I'm with stupid" T-Shirts. Anyone who knows Iain couldn't possibly believe that picture. The guy isn't wearing a Duchamp tie. Does anyone really care what this incompetent, incoherent, adulterous fatso thinks? This is the man who when Deputy Prime Minister thought fit to cavort with his secretary in government offices; whose every ministerial portfolio crashed into disaster; who likened Peter Mandelson to a crab, and how rants and raves when someone suggests that Armenians don't like him much. For pity's sake, the only reason Prescott is taken seriously is because those that do have no brains whatsoever. He was yesterday's man even when he was DPM; today he is a total irrelevance and should be treated as such. History will remember him only as an example of someone utterly unfit for their job. Dunno about the adult or the oxy. I think what's left speaks for itself. Not sure this sort of faux offence does anyone any good. It might not be funny, it might not have been done by the man himself but I hardly think it's a massive indictment on his ability to enter into dialogue(although listening to him is!). Looks like you're using this to lever yourself onto the moral high ground and that is, to use your mature wording of today, pants. How can you issue an adult invitation to an infantile moron. No better still still let him reappear and remind us all what we have been missing of late..
decorum and prescott is an oxymoron. he was, is and always will be labour's jealous and inarticluate northern clown, playing to the gallery while greedily hoovering up the trappings of office - secretaries included. no wonder he failed the 11-plus. he's a bilious man. treat him as such. It is amusing - but you can tell that the idiot fat boy didn't do it himself. The way he performs he would have manage to superimpose his own head on the t-shirt. Now that would have been accurate and quite possibly his greatest achievement ! Wapping Boy is absolutely right. Those comments should go on Fatcott's tombstone. Come on Iain lets have a adult debate about Armenia. Perhaps we could start with considering why none of this was addressed in your recent reports on the country. At least Prescott was upsetting and challenging some people - what were you doing? Of course the adult reaction is to get all your sock puppets to respond with even more childish abuse. If Iain didn't know that this would happen then all I can say is that Prescott's photoshopping falls within the category of fiar comment. Iain your mistaking Prescott for an adult and not the petulant ignorant obnoxoius prat that he is. This is his idea of debate, then? Perhaps his resentment is that his parents took him from God's country to live in Yorkshire? That's a bit rich coming from the 'adult' responsible for this? Its easy to get your own back. Just post a picture of his face superimposed on the fromt a packet of Norfolk sage and onion stuffing ? Is the "Let's Go 4th" Logo what Prescott and Newish Labour are aiming for at the election? I wouldn't worry about it too much, Iain. The more he does stupid things like this, the more likely a Conservative landslide becomes. I think Prescott is not best placed to make any comments about a democratic process -who engineered Regional Assemblies after being told 'no' by voters? I just left John Prescott a message, saying that the T-shirt picture was silly and puerile. Unbelievably, he didn't publish it.